WinDbg is a kernel-mode and user-mode debugger that is included in Debugging Tools for Windows. 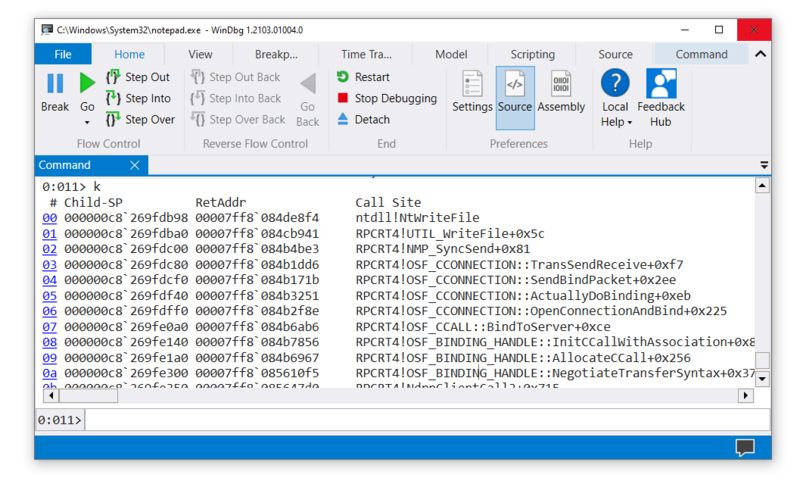 Here we provide hands-on exercises that will help you get started using WinDbg as a user-mode debugger. For information about how to get Debugging Tools for Windows, see Debugging Tools for Windows (WinDbg, KD, CDB, NTSD). Navigate to your installation directory, and open WinDbg.exe. The debugger documentation is also available on line here. On the File menu, choose Open Executable. In the Open Executable dialog box, navigate to the folder that contains notepad.exe (for example, C:\Windows\System32). For File name, enter notepad.exe. Click Open. 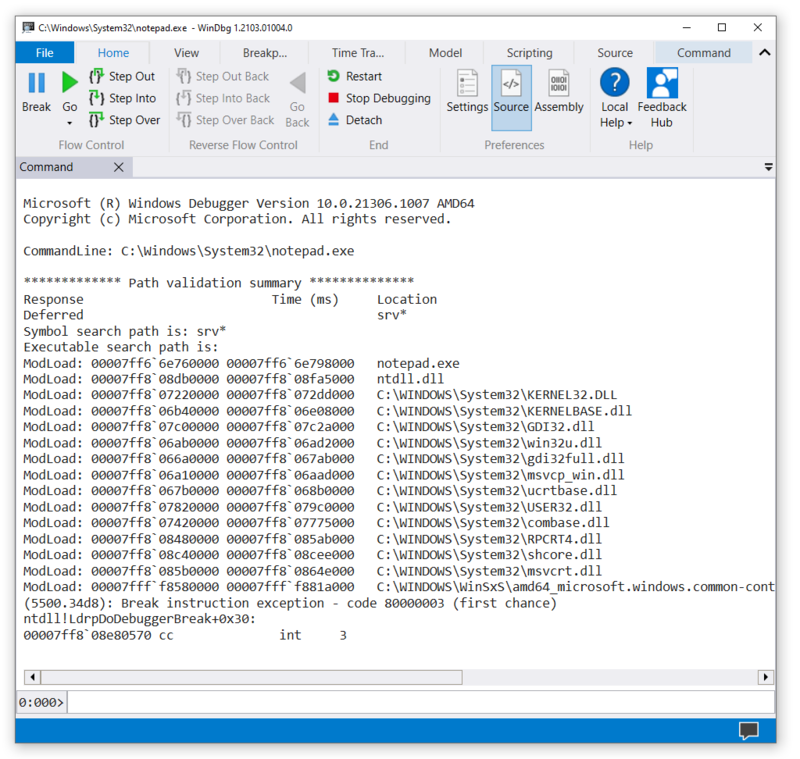 The symbol search path tells WinDbg where to look for symbol (PDB) files. The debugger needs symbol files to obtain information about code modules (function names, variable names, and the like). Note If you don't see any output, enter .reload again. Notepad runs until it comes to the WinMain function, and then breaks in to the debugger. To break in to Notepad, choose Break from the Debug menu. Enter g to start Notepad running again. In the Notepad window, enter some text and choose Save from the File menu. The running code breaks in when it comes to ZwCreateFile. Enter k to see the stack trace. In the WinDbg window, just to the left of the command line, notice the processor and thread numbers. In this example the current processor number is 0, and the current thread number is 11. So we are looking at the stack trace for thread 11 (which happens to be running on processor 0). In this example, there are 12 threads with indexes 0 through 11. Suppose you have written and built this small console application. For this exercise, we will assume that the built application (MyApp.exe) and the symbol file (MyApp.pdb) are in C:\MyApp\x64\Debug. We will also assume that the application source code is in C:\MyApp\MyApp. On the File menu, choose Open Executable. In the Open Executable dialog box, navigate to C:\MyApp\x64\Debug. For File name, enter MyApp.exe. Click Open. 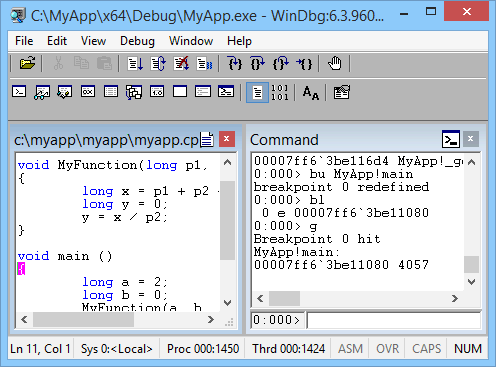 Now WinDbg knows where to find symbols and source code for your application. Your application breaks in to the debugger when it comes to its main function. WinDbg displays your source code and the Command window. WinDbg displays an analysis of the problem (division by 0 in this case).